Models can help to address a Flow Problem, but Beware! – Solids Handling Technologies, Inc.
Models can help to address a Flow Problem, but Beware! by Joe Marinelli, Solids Handling Technologies, Inc.
As consultants, we rely on established test methods and theory to identify, evaluate, and solve bulk solids flow problems. In this column we have written several articles covering proven solids handling test techniques such as shear testing, segregation testing and compressibility testing. What materials are you handling? What is their moisture content and how is it measured? What is their particle size? Are they exposed to temperature variations such as dried product entering a bin at 150 degrees F and cooling to room temperature? How long does the material remain at rest in the silo? This is critical to determine the effect storage at rest on the cohesive strength of the product. What discharge rate do you require from the silo or bin? What are the current bin diameter or capacity requirements for a new bin? What is the shape of the existing hopper? What is the silo or bin fabricated from, lined or coated with? What type of feeder is used to control discharge rate? What equipment is upstream and downstream of the bin or silo? Modeling flow in bins and hoppers has been performed for years and has served a very useful purpose. I remember my early years as a consultant helping to build models, running and evaluating test results and using the information to lend confidence to the conceptual designs I recommended. It is very useful when working with unusual geometries or complex handling equipment. Scaling becomes an issue at times especially when dealing with a cohesive product that has large arching and ratholing dimensions. Material of fabrication, which affects wall friction values and subsequently hopper angles, should be similar to those in a full scale system and are critical to model success. Can you use the actual product handled in the full scale application or do you need to find another material that will flow reliably in your model? Here we discuss a success story using modeling to help resolve a nagging flow issue. Our client was experiencing segregation problems handling their particular solid. We visited the site and determined from the visit and subsequent flow properties testing that the material was flowing in a funnel flow pattern whereby some material was flowing while most remained stagnant. The powder was subjected to sifting segregation as the fines concentrated in the center and the coarser particles rolled to the outside. As they initiated discharge from the bin, they noticed a high percentage of fines which negatively affected their product quality. In order to solve the segregation problems, it was imperative that the material flow in a mass flow pattern, whereby all the material is in motion whenever any is withdrawn, i.e. product flows at the walls. Because of headroom constraints simply replacing the existing funnel flow hopper with a mass flow hopper, was not an option. 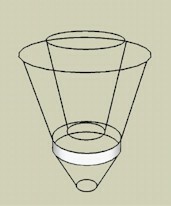 We therefore recommended a cone-in-cone design similar to the one shown here. The inner cone is fabricated from 2B stainless steel while the outer cone is lined with 2B stainless steel. This approach assures mass flow because the inner cone forces material to slide along the walls of the formerly too shallow outer cone. Notice the lower cone below the cone-in-cone set up as it will become important later. After a few months of operation, it was determined that the bin was still experiencing segregation issues. This was puzzling since the cone-in-cone anti-segregating design should have solved the problem. When these type problems occur, it is usual due to material changes, installation and/or fabrication errors, etc. As far as we could determine, the fabrication and installation was as required and the material had not changed. We then visited the site several time and we were able to observe the powder actually flowing. The bin was filled from empty with about 40 tons of product. The level of the product was just above the inner cone. The bin was then packed out at a rate of about 1000 lb/min. Immediately it was noticed that the inner cone only was flowing. The material flowed in mass flow (flow along the walls) in the inner cone, until it was empty. All the while, the annular region between the inner and outer cone did not flow. After the inner cone emptied, the annulus began to flow. Flow continued as mass flow in the outer cone area. As a result, we fabricated a scale model of the bin in our laboratory using an existing 14″ diameter 60 degree, conical hopper modified with the addition of an inner 75 degree cone. This unit is scaled to exactly represent the existing bin. The model was filled with product supplied by client to the same level as was observed in the field (just to the top of the inner cone) and flow started. We video taped the flow through the unit and observed that flow was as expected, uniform with both the inner cone and annular region moving towards the outlet, as shown in the video here. We then tried several experiments to determine what could be possibly causing the inequality in the field. We raised the inner cone, we lowered the inner cone we enlarged the outlet, thinking that perhaps the field install was not exact. We noticed that while small changes in the lab equate to large changes in the field, there was only a minor effect on flow. After several days of trials and head scratching, we finally noticed that the lower cone of the full scale bin, attached to the vertical section at the outlet, sloping at 75 degrees was fabricated from carbon steel instead of 2B stainless steel as recommended. We ran a wall friction test on carbon steel and discovered that the angle for mass flow is required to be 78 degrees to ensure flow along the walls of the lower cone. We then roughened the walls of the lower cone of our laboratory model (installed sandpaper) and reran the test. The inner cone emptied first then the annular region emptied, just as in the field, as shown in the video here. This meant that the lower cone was not capable of mass flow (in the field), creating a funnel flow pattern and causing the inner portion of the cone-in-cone to empty first. We recommended that the lower cone be replaced with 2B stainless steel cone sloping at 75 degrees to ensure mass flow. The bin has been functioning properly for over one year now. Guest articles for the Ask Joe! Column are always welcome, for more information please contact Joe Marinelli directly at his email address: joe@solidshandlingtech.com. « Should My Material Be Tested On-Site?